West Gate office park, owned by Genesis Property, extends partnership with Lagardère Travel Retail Romania by opening two new units – 1 Minute and So! Coffee. The first 1 minute unit was opened in 2013, at the ground floor of the H5 building. “The presence of two new Lagardère units in West Gate Park demonstrates the interest we are making to continuously improve the range of services available to our tenants’ employees. The Café at the ground floor of the building is no longer a nice to have, it is a must have on the list of their wishes. The global experience of an international operator ensures both the superior quality of the products and the delivery of an excellent service experience to our customers, which are extremely important for us, “said Liviu Tudor, president and founder of Genesis Property. “The opening of So! 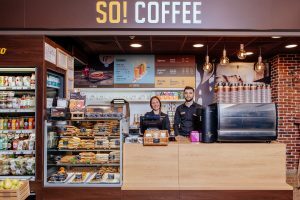 Coffee café and the second 1 minute store at West Gate Business District represents for us the sequel of a successful partnership with Genesis Property developer, four years after the first 1 minute launch in this office park. The value of the investment for these two new units amounts to approx. EUR 95,000, but even after their launch, we will continue to invest in team training and customer service training to ensure customers have the most enjoyable experience on 1 Minute and So! Coffee networks in a modern environment, with a fast service and a professional customer service. ” said Petruta Ionita – Head of Marketing & Store Planning | Lagardère Travel Retail Romania. With over 165 years of experience in trade from transit areas, Lagardère Travel Retail is one of the world’s leading Travel Retail players, with over 4,100 shops for three business lines: Duty-free & Luxury, Travel Essentials and Foodservice. In 2016, the Lagardère Travel Retail division recorded a turnover of EUR 4.2 billion. In Romania, the company has been present for more than 20 years on the retail market and operates a network of over 245 stores for News & Convenience, Gifts & Souvenirs and Foodservice segments with several brands, the most well-known of which are Inmedio, Relay, 1 Minute and So! Coffee.